The female entrepreneurship course has started! 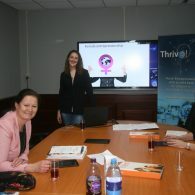 Home - News - The female entrepreneurship course has started! On Tuesday 26th of March, the first lesson of the female entrepreneurship course has started. The first lesson took place during the industry trade fair ‘Sign & Print Expo’ in the Dutch city of Gorinchem. The 5 participants are all women working in different disciplines in the creative sector. Either as director, or as a self-employed, or having a position in the management team or a middle management / leadership position in the company. They represent companies from the printing and the sign sector. Each of the participants is very motivated to follow the course and after the first session they indicated that they already learned a lot and that they are looking forward to the next lesson. The teacher Leanne Janssen, who co-produced the learning material, is very enthusiastic about her students. “They already tested the awareness scan and are highly motivated to improve their scores!”. Stivako wishes the students and the teacher good luck with this new course!